Email marketing, as we probably all agree, is not the be-all and end-all. As David said, it’s simply one piece of the puzzle: a piece integrated with many other pieces, working together, to build a consumer experience with a brand (online or off). It’s a tactical representation of a communication that we, the marketer, want to have with our consumer. It’s not the only communication that our organization has with a consumer, and that fact requires us to adjust our thinking. In the end, it’s not about email; it’s about the customer experience and how email plays into and supports that. So what does that mean to you and me, who are responsible for the email channel? It means that it’s time for us to step up. To challenge our organizations to think of email not as a separate silo, but as an active part of the consumer experience. I totally agree! Continue reading her article here. It's well worth a couple of minutes of your time! Increasing email deliverability is both an art and a science, and to really get results, you need to have some expertise in both. 1. Open test accounts at each of the major free webmail hosts, such as Hotmail and Yahoo, and add them to your mailing lists. 2. Run your email through a spam filter like Spam Assassin before you send it! 3. Keep it Simple: One of the biggest problems that legitimate email senders run into is trying to make a single email do too much. So they put tons of unnecessary HTML and lots of links in their email, without realizing that the more they put in, the harder it is for that poor little email to run the gamut of spam checkers and filters, and to get to the inbox. If you get one complaint out of thousand emails sent, your dedicated IP address runs the risk of being blocked by one or more ISPs. 1. Never harvest email addresses off of Web sites. 2. Even if it is opt-in, be careful when sending to an old list that has not heard from you in a while. 3. Do not just email every contact you have. 4. Do not purchase email lists. 5. Too many hard bounces (email addresses that do not exist any more) can get you blocked by a number of ISPs. 6. Do not send too many emails at once but ramp up. 8. Configure a Sender Policy Framework (SPF) record in your Domain Name Service (DNS) records for your domain name (company.com). 9. Make sure to do a plain text version of your email, too. 10. Very small fonts can get you filtered. 11. Consider putting the unsubscribe link at the top. 12. Maintain a good balance of graphics to text. AOL announced its plans to begin DKIM verification sometime this next year during an ESPC call moderated by Ben Isaacson of CheetahMail with special guest Mike Adkins from AOL. DKIM is the next generation of DomainKeys, an encryption based authentication method, which is picking up adoption in the receiver community. Currently, AOL uses an IP based reputation algorithm to determine the propensity of outbound mail to be spam. Under the new paradigm, a sender’s domain will be verified against the DKIM signature with inbox success being determined by that domain’s reputation. Mike proposed that by the end of the first half of 2009 an initial version checking the signature will be in place. As part of this, AOL has deployed an address where any sender can check the validity of a DKIM signature against the AOL DKIM implementation. To check a signature, send an email to any address at dkimtest.aol.com. It was also mentioned that SPF will be actively used as another data point providing information about a sender, whereas now SPF is checked but not used in the reputation algorithm. The eec Email Design Roundtable have added a Landing Page Checklist to their Email Checklist Series. This checklist offers a collection of ideas that you can easily apply to your program. How often should you send to your list of subscribers? It depends on your audience, your product, your content, and your marketing goals. These elements ultimately determine “your” optimal frequency. John Kirk provides some basic guidelines. The reality of today's multitasking market place means none of us exist in a vacuum. As we all compete for engagement, the use of a single slice marketing medium approach is no longer sufficiently supportable. The exclusive path to sought after opportunities must be a shared one. Today is also a sensitive political environment with strong opinions on the use of various marketing tools and their perceived intrusiveness. Mindless communication blasts to anyone pre-qualified — or not — is often viewed as unwanted additional noise or junk and incents the clamor for a more responsible, self-enforced coherent approach. Recently I was looking at soccer uniforms for my son's team. I went to a local retail outlet and registered for additional information. Soon thereafter I received a printed catalog in the mail with a variety of clothing options. Then I received a postcard notifying me of an upcoming event sale. No sooner did I get the postcard in the mail then I also received a follow-up e-mail supporting the same graphics seen in the postcard plus pictures of available uniform complete with my son's teams name displayed. I was directed to a Web site and the sale was made! This entire multichannel experience had me engaged. It was fun and had my attention with several distinct but related consistent touches. Special emphasis should always be placed on when the prospect actually engages. In conventional direct mail that means use of available tools to confirm when an individual piece of mail is actually received in-home not just placed in the mail. This then determines an “event,” and can and should trigger additional communication phases across multiple mediums including e-mail, print and even telemarketing. Driven by robust tracking options one can confirm within statistical reason when someone actually receives the individual piece of mail. These mailpiece tracking systems are powerfully used as a trigger for the now well placed and critically well timed follow up or supporting e-mail speaking to the same topic and engaging to the next step. 1. Audience and Goal. Thinking about your intended audience and the actions you want to inspire were your primary foci in creating your email, and they’re also the core of the landing page. Construct your landing page to propel your audience toward1s the next step. 2. Design. To facilitate the unity of the experience, the creative elements must stay consistent with the email—use similar graphics, text and imagery. Keep your designs quite simple—consider losing the navigation and extra links that will distract from the primary message. Use images if they can earn their keep by relating specifically to your offer—steer clear of distracting, generic imagery. 3. Main Copy. Best practice is to use a white background behind text. Keep your copy brief, and start it off by stating the benefits of the offer concisely and in manner consistent with the email copy. It often works well to use bullet points and a large font for readability, listing the benefits in order of value. Every word should work toward getting the visitor to act. 4. Forms. If you need to gather customer information with forms, hold interest by keeping them short and sweet. Ask only for the most necessary information, clearly indicate required fields and pre-populate those fields whenever possible. Include all forms and CTAs necessary for conversion on the landing page. 5. Call-to-Action. Your landing page’s great love, its reason for existing: the big CTA. But don’t stop at one: repeat your CTA multiple times to maximize clicks. The initial CTA should live right after the summary of the offer details and needs to fall above the fold. The CTA copy must be direct and obvious and pack a punch that inspires action. Be careful not to drive your sale to soon—let the CTA match the subscriber’s place in the decision-making process. If you’re a retailer, consider using an “Add to Cart” button as opposed to something like a “Buy Now” button. 6. Other Tips. It may also be a good idea to create multiple landing pages so that they can get as specific as possible to different customer segments. Keep your landing pages live for longer than you’d expect. You don’t want people who read their messages later than the rest of the crew to be sent flying with nowhere to touch down and act. A solid landing page that attends to best practices offers customers a memorably smooth experience with your brand while effectively increasing conversion. For even more tips and tricks, check out the new eec Landing Page Checklist. There are two important things marketers can do to evolve their email strategies and improve interactions with customers and prospects. One is to improve the personalization within the emails themselves, and the other is to better coordinate these emails with other channels such as direct mail, phone and mobile. Email marketing is evolving from simple approaches to more behaviorally based multivariable, or dynamic, approaches. Multivariable, or dynamic, email marketing relies on multiple components to determine the next marketing step, including data obtained from user profiles and actual user behavior. For example, suppose a customer visits a women's clothing website where she has previously made a purchase. She clicks through a couple of pages, spends extra time on a page with shoes, taking a closer look at specific styles and colors, but then leaves the site without buying. The customer then is treated to an email offering a discount (her user profile is already in the system) on a pair of shoes -- buy one get one half-off -- promoting just the style she spent the most time viewing. What is perhaps more wasteful than using simple email marketing is the use of email campaigns that are not well-coordinated with direct mail, telemarketing or mobile initiatives. Coordination and consistency are very important -- imagine a customer's reaction to receiving two different offers from a triple-play telephone/cable/internet provider. One arrives by direct mail and offers a bundle of all three services for $99 per month. One arrives via email and offers the same bundle at $99 per month plus as an additional incentive, a free HDTV. The consumer calls the toll-free number on the mailed postcard and asks about the email offer. The call center agent isn't aware of the HDTV offer and cannot honor it. The customer is annoyed and, believing the experience may be symbolic of the type of service she can expect should she switch, decides to remain with her current provider. Situations like this arise when companies take a multi-channel marketing approach versus a cross-channel marketing approach. "Multi-channel" infers the ability to drive marketing through multiple channels -- something most marketers have certainly achieved. Meanwhile, "cross-channel" denotes the ability to drive the coordination and consistency of a campaign's message across channels. 1. Never send to anyone who didn't give you explicit consent. Recipients are now conditioned to use the spam button as a way of disposing of unwanted and unknown e-mail messages. 2. Don't send to old addresses that have been sitting idle in some database. This is like going up to an adult on the street, telling him you were his preschool teacher and asking him if he remembers you. 3. Send regularly. Don't wait too long between messages, but don't send too frequently, either. Remember, the key is to have the recipient recognize and appreciate your message. 4. Clearly identify yourself in the from field. Using your company or brand gets your message recognized, and hopefully opened. 5. The subject line needs to truly represent the message content. The subject line shouldn't try to trick the recipient into opening the message. Use the subject line in tandem with the from field to build brand awareness and highlight the value of the message content. 6. Add a couple of sentences to the top of your content. This lets recipients know why they're receiving your message and where the unsubscribe link is. The "click here if you have trouble viewing this message" and the "please add our from address to your address book" are great for people who know why they're receiving your message and want to receive it. But what about those who don't? 7. Make sure the message content looks professional. Also, make sure it's engaging, offers value and isn't too long. 8. The unsubscribe link needs to be easy to find. It also must be easy to use — to get to it, visitors should only have to click two times at the most. 9. Move the unsubscribe link to the top of your content. This helps reduce complaints, especially when you're sending to new list members. 10. Honor all unsubscribe requests. Nothing gets a complaint faster than sending an e-mail to someone who's previously unsubscribed from one of your lists. How Soon Do People Open Their Email? – Much sooner than before! Nearly one third, 32.26% to be exact, of all opens occur within the first two hours compared to 29.57% six months ago and 29.40% a year ago. Open Rates – There was only a marginal decline in the average open rate, now at 13.20%, compared to 13.98% in the second half of 2007, which was a refreshing surprise after seeing these numbers tank last year. Recipients are opening emails just a little sooner, too. About 75% of all opens occur within the first 24 hours compared to 74% last year. Click Rates – Recipients continue to click at about the same rate they did six months prior, with click rates sliding down just by a hairline of 0.17% to 2.73%. Best Days to Send – Sundays, yes Sundays, and Mondays still hold the crown. Seems that a lot of us check email on Sunday nights to prepare for the upcoming week. Subject Lines – Our newest chart shows a pretty convincing metric: in general, the shorter the better. But you really should test what works best with your audience and the types of messages you send. Personalization – Personalized messages result in higher click rates, but now get lower open rates, probably because so many spammers use this as a trick to get people to open messages that we are now conditioned not to open personalized emails. Deliverability – Bounce rates dropped again this half, meaning that more messages are getting delivered. Number of Recipients – Emails sent to fewer people were opened and clicked on more, just like in previous years. A smaller list size does not directly affect open and click results. However, mailings to smaller lists may be targeted better, contain more relevant content, or have more recent subscribers. Yep - you heard right. Back in 2005, George Bilbrey of Return Path wrote a blog "It's not your ESP - it's YOU!" 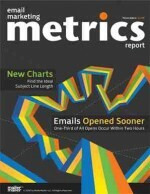 and MarketingProf's also published an article recently "Email Deliverability is in Your Hands". This seemed to be the theme which was threaded through many of the presentations at both the London DMA's recent conferences. It appears that most marketers seem to think that they can buy deliverability - by changing ESP's or paying for accreditation. However, neither of these solutions will work unless the marketer is doing Best Practise. Part 1 - Deliverability to ISP's - IP Reputation: This is a combined effort by the ESP and the marketer. The ESP needs to have everything ready and waiting for the Best Practise Marketer. Things such as the infrastructure, whitelisting, delivery monitoring, Feedback Loops, education about Authentication and enabling/assisting clients to become authenticated are all things which the ESP can do. However, the main causes of emails not being accepted by the ISP is due to the percentage of spam complaints and bad addresses....and having a clean and up to date database is the responsibility of the marketer. This is where having a good Sender reputation is crucial and if you're on a dedicated IP address - well, hey..there's no one to blame but yourself if your reputation isn't as good as it could be. Part 2: Deliverability to the Inbox - Brand Reputation. So, you got accepted by the ISP/mail server and they have delivered you to the recipients email client? Excellent - but will it be delivered to the inbox or the junkmail folder? This is where your brand, sender name, subject line, good clean coding, choice of copy, domain reputation, message relevance and things like image to copy ratio are taken into account - both by the spam filter and by the recipient. ESP's can assist you with all of the above factors - but ultimately, the responsiblility of deliverability comes down to you, the marketer. Therefore, if your deliverability isn't as good as it should be - look to implementing Best Practices rather than changing ESP's. Are we discriminating against our best customers? In the November Issue of Infobox, Dela Quist of Alchemy Worx, looks at why we keep rewarding those customers who haven't opened your emails, who haven't bought in a few months and who abandon shopping carts etc, yet, do not implement a positive reward scheme for those who actually purchase regularly. As Dela sums up 'Good customers need rewarding too; so when implementing an incentive based scheme, it is always worth asking yourself if you are discriminating against your loyal customers and how they would feel if they found out. This is a subtle but important change in emphasis that could yield significant results'. 'Tis a very good article and is sure to set you thinking: Are we discriminating against our best customers? Also in this issue Stefan Pollard of Responsys is interviewed on the art of segmenting and the beautiful and creative Lisa Harmon of Smith-Harmon, advises on designing effective Holiday Season creatives, whilst Simone Barrett of e-Dialog, looks at how to protect your brand from phishing. Ben over at MailChimp spoke to Comcast's senior spam analyst and shares what he heard on their blog. "For those of you familiar with ISPs and abuse desks in general, none of this is all that new. The interesting stuff is how forthcoming and helpful Comcast is with their error codes and rate limiting charts," he says. Comcast really, really hates it when you send to an old list (with lots of undeliverable email addresses). If you’ve got too many emails on your list that no longer exist, Comcast will block your IP address. Comcast doesn’t like it if you send too many emails all at once to them (this one’s kind of a no-brainer). Here’s what makes them different: they’ll actually TELL you how many you’re allowed to send at once. there’s a shift (again) in the way ISPs and email receivers judge emails as spam or not. Instead of relying on blacklists or focusing on bad content, they’re looking at your overall reputation as a sender. Email lead-nurturing programs can help turn many cold and warm leads into those that are sales-ready. On average, about a third of your list (or more) turns over every year due to bounces (2% to 3% each month), unsubscribes and spam complaints. Here are some clippings from an article by Wendy Roth on "recession-proof email tactics". To summarize, she tells us to do more with inactives on our houselist, don't increase frequency and use segmentation to target the right message to the right audience. look for opportunities you might have overlooked in flusher times by waking up your inactive subscribers. try to either bring them back into the fold or encourage them to take themselves off your list instead of filing spam complaints or deleting your messages. 1. Set your parameters. Are subscribers inactive if they haven't bought from you in two years, or if they just haven't clicked on your emails in six months? 2. Create a sublist of addresses that fit your inactive criteria. 3. Create a special message. Send a special, limited-time-only come-back offer, dangle a discount for filling out a profile, or link to a survey at your site to find out why they went dark. instead of sending out more email in hopes that something will stick, try sending messages that will mean more to your subscribers. Go back and look at how your program performed over the last year. Which efforts had the best response? If nothing looks hot, maybe it's time to try a little targeting. A good subject line may catch a reader's eye, but the text that follows can determine whether your email is opened or deleted. The top-line, or snippet, is the first sentence in your email that gets displayed after the subject line. A correctly worded snippet builds on your subject line and helps your readers, especially mobile readers, decide whether to save the message or to read it immediately. Conduct an A/B test, sending your standard email message to one half of your database and the revised version to the other half to see if you notice a lift. You cannot afford to waste a single line in your email message, whether it's a gorgeously designed, artistic-quality HTML message or a plain-text, no-nonsense email. The top line is your opening shot to tell the reader your message has value and should be seen. Personalized Subject Lines: Beneficial or Bad? Probably because what works for one sender and one kind of message doesn't always work in other situations. Personalized subject lines do have a place in the e-mail world, but only if they have a logical use. Personalization when poorly done ("Another Great Deal for $'YourNameHere'$") looks spammy and unprofessional. personalization: It adds no value to the subject line's main goals. Names catch the reader's attention, no doubt about that. That's not enough to justify using personalization without a clear strategy, but it means the idea is worth exploring. If you truly want to test first name personalization, think long and hard about who is talking to whom, and personalize the way you would speak.